This is my first post on the Ecomedia Studies blog, so I thought I’d dive in with some ruminations on the environmental footprint of virtual worlds like Second Life (SL). Yes, I know SL is troughing on the hype curve these days, but I think it’s too early to write off that particular platform, given the rising popularity of its opensource alternative OpenSim as well as recurrent predictions that the future WWW will be a three-dimensional one (take a look at ExitReality sometime if you want to get a feel for how that might work). I’m a doctoral candidate in Environmental Communication here at Florida State, and my dissertation will address the way virtual worlds reinscribe (or possibly challenge) ideas about Nature. SL is an instance of “virtual reality” or, more specifically, a “multiuser virtual environment” in which users interact within a persistent three-dimensional virtual space and are represented by more or less anthropomorphic avatars. It resembles massively multiplayer online roleplaying games like World of Warcraft in its ability to reflect human fantasy in a convincing virtual world, but SL has no gameplay conditions, so it’s better thought of as a social medium than a game. SL is also set of material, cultural, and social practices circulating around a service provided by a California company called Linden Lab (LL). The company was founded in 1999 by Philip Rosedale, who gained prestige and financial clout following a stint as chief technical officer at Real Networks, a pioneer in online video streaming. Rosedale was joined by former executives from such new-media players as Electronic Arts, eBay, Disney, Adobe, and Apple, and within ten years the company had grown to about 250 employees at its San Francisco headquarters and satellite locations. Recent economic downturns have cut that workforce to about half that size. Although it is more of a social network than a game, the appeal and visual appearance of SL are clearly related to video games and MMORPGs. These in turn have been driven by advances in computer graphics and inexpensive processing power, as well as the amount of free time available to affluent adolescents and young adults. Thus SL is only possible in an economy with plentiful leisure time and disposable income. Furthermore, SL accelerates problems of waste disposal by requiring advanced processing and graphical capabilities that encourage early disposal and replacement of computer hardware. The technical infrastructure of SL’s servers and the client-side computers of its thousands of users have material costs, some of which are externalized and nearly invisible from marketing materials and coverage in the business press. According to anthropologist Tom Boellstorff, the data residing on SL servers represents 50 times the information contained in the entire United States Library of Congress. Like all Internet services, SL relies on basic industrial processes whereby minerals and petroleum products are extracted and modified, under at times unknown conditions in overseas markets, then through a capitalist process of wealth flow, consumed in affluent societies. Linden Lab has never been explicitly connected with sweatshop conditions, or scandals like the suicides of Chinese factory workers in the Apple iPhone production chain, but the company operates within a modern global capitalist high-technology market that includes such abuses. Cheap and ubiquitous computing requires a certain degree of cheap labor, a fact that isn’t appended to every Twitter post or Facebook update like the warnings on cigarette packs. The production of computer hardware and its employment also has health and environmental impacts. Longterm computer use results in physiological effects (such as vision impairments and carpal tunnel syndrome) as well as psychological effects from immersion, e.g. so-called Internet addiction. The servers also require a significant amount of electrical energy, which tends to come from nonrenewable and carbon-producing sources (see smonani’s post here, The hungry internet, as well as Peter Arnfalk’s keynote on “Greening IT” delivered at IR11, for more general issues about the ecological footprint of our electronic media). Although there has as yet been no detailed analysis of SL’s carbon footprint, blogger Nicholas Carr famously conducted a back-of-napkin calculation that put the energy consumption of a Second Life avatar at roughly equivalent to that of a citizen of Brazil (the real-life one). That a virtual human can consume more energy than a real one in an industrialized nation like Brazil only highlights the inequalities that SL can reproduce. There is even an independent service within Second Life that allows one to purchase carbon offsetting credits for one’s use of the virtual environment. But while environmental-advocacy groups have availed themselves of SL as a tool for meeting, community building, social marketing, and demonstration projects, an energetic discussion on the blog of game designer Tony Walsh on the blog Clickable Culture clearly demonstrates that some users feel that these SL environmentalist players have not adequately addressed the impact of the tool they’re using. 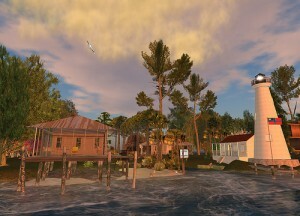 One of Second Life’s great strengths is its ability to create immersively real, convincing replicas of real-world phenomena, without many of the material constraints of physical models. It allows such replicas to be generated by anyone who can muster the capital to purchase land, and so, while it is subject to market constraints, it permits a wider range of voices than a proprietor-built world like World of Warcraft can. It can also generate a “you are there” feeling of social presence that stimulates both embodied experience and realtime debate about the merits of policy choices. Thus far these strengths have not been adequately employed in self-critique. While griefers and other protesters have resisted the inroads of commodification, and the carbon offsets projects are promising, there is as yet no use of SL to model itself and its economic and environmental impacts. A project comparable to the culture-jamming work of Adbusters would seem to be an ideal fit, problematizing the very notions of virtuality and blurring boundaries between the physics within SL and its RL environment. Very exciting project. There’s definitely a methodology here that can apply far beyond Second Life. But I also think Second Life provides a great case study given the depth of your research and insights into the connections between media, culture and environment. Really appreciate your attention to the RL material impacts of SL.